Born deep in the Rocky Mountains stands a Man today who reaches 6’6” and 270b lbs of solid Mountain Man. He hunts and survives as the mountain men did in the mid-1800’s. Born of indian ancestry and trained with the skills of true mountain men, Laramy “SASQUATCH” Miller travels the route the mountain men did before him. From deep in the Canadian Rockies to the plains of the midwest he hunts, traps, and lives off the land. 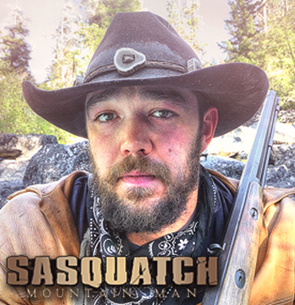 He does it all the hard way, the SASQUATCH way- in a world of high-tech hunters, weapons and technology, Laramy “SASQUATCH” Miller shows us what real hunting and survival in the great wilderness truly is! Listen to Rob Drieslein’s interview with Laramy Miller. © 2015-2019, ODN Shows, LLC. To buy tickets for your firearm safety class at the Outdoor News Deer & Turkey Classic, we have to redirect you to Eventbrite for your payment to be processed. Once the transaction is complete, please return to the Deer & Turkey Classic site to print off your permission slip. To pay for your booth and electrical at the Outdoor News Deer & Turkey Classic, we have to redirect you to a secure site for your payment to be processed. Once the transaction is complete, you will be redirected back to the Deer & Turkey Classic site. Advanced ticket sales for the 2019 Outdoor News Deer & Turkey Classic are now closed. Please visit the ticket booth at the Warner Coliseum on the Minnesota State Fairgrounds to buy your tickets. However, we are still offering $2 off coupons. Get yours now.